50,144 words in 29 days! I did it! I did it! I wrote 50,144 words of my novel between the 1st and 29th of November! I’ve just finished and I thought I should let you know. I’m singing and dancing. I’m grinning stupidly like a cat who got all the cream. This is by no means an acceptance speech (you know the kind celebrities give when they receive an award) but I want to say a special thank you to a few people who were key in helping complete the challenge. Mo Cushla, as always, for your tireless support and encouragement. Kiru, for being a mentor and friend. Joxy, for your kind words. Deronk, for checking up on me regularly. The Romance Writers of West Africa (RWOWA), for being a fantastic support group. I’m so pleased I did it and finished with a day to spare. It would appear I do have some sitzfleisch after all. Like I said, I finished and just wanted to share the good news. I’m still in the thick of my NaNoWriMo challenge. I’m sorry if you’re fed up of reading about it. However it is probably all I’m going to manage to blog about this November. I’m making good progress and have written 39,281 words of my novel. I’m thankful for how well it has been going in spite of life getting in the way. It’s funny how I’m able to squeeze in the time to write everyday because I’m determined to complete the challenge. I get a high from checking the word count feature at the bottom left-hand corner of Microsoft Word as I type and see the numbers climbing higher and higher. It is quite intoxicating and inspiring. Never has a little gizmo such as the word counter given so much pleasure. The emphasis of this challenge is quantity not necessarily quality. For now, my sole focus is to write at least 50,000 words by the end of the month.I will worry about all the do’s and don’t’s of writing come December. It is after all, a first draft. Editing, fine-tuning and all the other bits that go into making a draft publishable will come later. In the meantime, in the words of Nike, I’ll just ‘write’. What have you been up to this month of November? Please share. Will you come into my parlour? said the spider to the fly. I haven’t got much time to write a proper post as I’m trying to stay on target with the NaNoWriMo challenge. I’m pleased to say I’m currently on target and have written approximately 27,146 words to date. I remembered this poem from my childhood and thought I’d share. Enjoy! “‘Tis the prettiest little parlor that ever you may spy. “I’m sure you must be weary, dear, with soaring up so high. Well you rest upon my little bed?” said the spider to the fly. Within his little parlor – but she ne’er came out again! The morale of the poem still rings true even today, flattery will get you nowhere except the spider’s tummy. I am preparing a blog post but between trying to write my daily quota for NaNoWriMo, work, kids, visiting relatives and life in general, it’s not quite finished. However I thought it only fair to keep you abreast of my progress on writing 50,000 words this month as I promised to do. I am pleased with my progress and proud of what I’ve written so far. Today is day 8 of the challenge and I have written 12,619 words so far. Thank you very much for your support and words of encouragement. It was my birthday last Friday and I had a really great day. Thanks to everyone who sent a birthday greeting, you made me feel really special. First let me start by apologising for missing updating the last two weeks. I could give you reasons but they would really just be excuses so I won’t bother. Welcome to the most special month of the year, November. It is the penultimate month of the year. If you are still struggling to achieve goals you set in January, you still have sixty-odd days to attempt to do so. It is the beautiful time of year when fall/autumn gives way to winter and it officially marks the start of the extremely magical Christmas season. But best of all, it is the month in which I was born. Even the founding fathers of the United States of America acknowledged how special it is by setting aside a day in it for Thanksgiving. 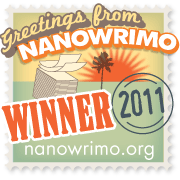 This year, November is also special to me because I’m taking up the NaNoWriMo challenge. NaNoWriMo is an acronym (or whatever the word is for making up another word with the first two or three letters of other words) for National Novel Writing Month. It is an annual internet-based creative writing project which challenges participants to write 50,000 words of a new novel between November 1 and November 30. The project was created by Chris Baty in 1999 with about 21 participants. In 2010, over 200,000 participants signed up to take part and almost three million words were written. To read more about it, please check out the website and the wiki page. This is a really big step for me. My writing has come a long way this year but this will stretch everything in me even further. Finding time to write approximately 1,667 words a day in addition to all of the other things I have to do will be a challenge. But it’s one I take on with a mix of apprehension, excitement and great expectations. This cartoon very aptly portrays my sentiments towards the challenge. I don’t make any promises about the quality of the words and how they will be strung together but I will endeavour to keep churning the words out in a bid to meet the target by the 30th of November. I’m pleased to say I’ve made a great start today with 1,765 words. Long may the words continue to flow (and make sense). Feel free to ask me how I’m doing. You never know I might even be persuaded to post excerpts on here.